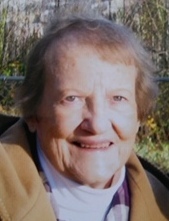 OTTAWA - Eula Jo Spencer, 92, was called home to be with the Lord at January 19, 2019 at 6:20 PM, at The Meadows, Leipsic, OH. She was born March 26, 1926, in Liberty Township, OH to the late Lorta Huntsman who preceded her in death. On September 1, 1950 she married David W. Spencer, who died September 20, 2006. She leaves her loving memories to be cherished by her two children, a daughter Catherine Ann (Jerome) Mominee of Buffalo, NY and Rich (Maggie) Spencer of Sylvania, OH and two grandchildren, James and Maradeth Spencer. Also surviving is her brother Clair (Emilie) Huntsman of Wilmington, NC and sister Marcia Kavanaugh of Seattle, WA and numerous nieces and nephews. She was also preceded in death by a brother, David Huntsman. Eula Jo was a member of the Trinity United Methodist Church in Ottawa, she retired from Phillips ECG, Ottawa, and in retirement was a secretary for Ottawa and Leipsic United Methodist Churches. In addition she was active member of the Ottawa Senior Citizens. A proud 1944 graduate of Leipsic High School and International Business College of Ft Wayne, IN. Funeral services will begin at 12:00 noon Monday, January 21, 2019 at Heitmeyer Funeral Home, Ottawa with Rev. Geoff Eubanks officiating. Burial will follow at Harman Cemetery, Gilboa. The family extends their appreciation for the love and professional care extended by Putnam County Hospice and the Resident Teams at Putnam Heritage and The Meadows of Leipsic. In lieu of flowers, memorial contributions may be made to the Putnam County Hospice.